‘Peo Daade Ka Khol Dithha Khazana’ – An article on for the new students. In this fast paced life, where each single individual is groping hard to survive in the complex world of paradoxes. Time to halt and reflect seems to be a rare commodity. Humanity on the whole yearns for the two jewels – peace and happiness. Is religion scientific? Does religion answer all our queries concerning relationships, morality and self doubt? Is religion confined to performing rituals or it has something more to offer. Some dig into new age meditation techniques, others read self help books. India on the whole has become a booming market for spiritual gurus – each claiming his philosophy to bring the ultimate ‘Nirvana’. What we fail to understand is that these Gurus serve us with what our scriptures had foretold hundreds and thousands of years ago. If only we took the initiative to open and understand what they offer. Delhi Sikh Gurudwara Prabandhak Committee has initiated a short term course in‘Gurmat Studies’ held every Saturday and Sunday at Mata Sundri College, New Delhi. 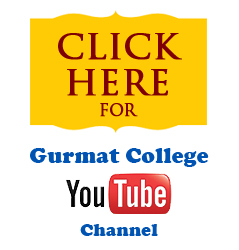 The lectures are on various subjects and topics that our Gurus touched upon. ‘Guru Granth Sahib’ is the universal scripture, revered and respected by the people of all religions, caste, color or creed. Gurubani is not only a way of life but it also engulfs and enlightens us on all the important aspects of our existence whether political, social, cultural and personal. The beauty of the Gurubani as a philosophy lies in the fact that it can be interpreted and applied spiritually as well as individually in the worldly life. Its relevance in present scenario is unquestioned. It talks of Women Empowerment through equality on one hand and Environment and how Science and Religion are inter dependent and inter connected on the other. How the Earth came into being and how we evolved from being an animal to man? Scientists are discovering what our Gurus talked of Five hundred years ago. It not only talks but rather offers solutions to the grave problems faced by youth today. It brings clarity of thought and empowers our soul. “Kich Suniye, Kich Kahiye” – The entire Gurbani is a dialogue! All the issues can be resolved through a dialogue or a healthy discussion. ‘The Sidh Goshti’ is the ultimate example, where Guru Nanak Dev had a discussion with the ‘Jogis’. This entire conversation explains how serious matters can also be discussed cordially without offending any individual’s views. A thought crosses our mind that we all want others to listen and to avoid arguments we stop all the discussions. That rather aggravates the problem. Gurbani tells us ‘Dithe Mukat Na Hovai, Jichar Shabad Na Kare Vichar’…We just have to ponder and reflect on what the ‘Guru Granth Sahib’ talks of. It sure would lead us as a torch bearer from the darker alleys of confusion and conflict to the sunny world of hope and happiness. Wishing you all the very best in this little journey you’ve showed interest in today! Guru Ang Sang, Guru Raakha!